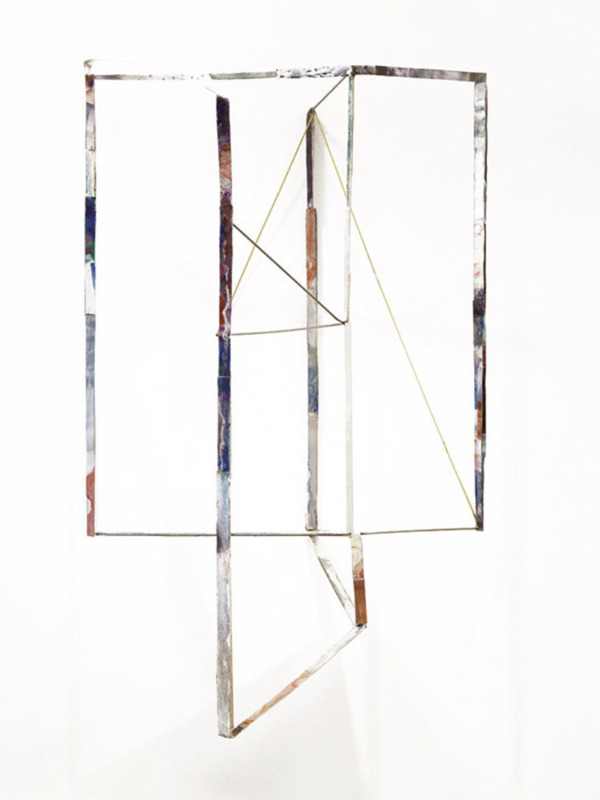 Sara Barker, Draft overlapped, 2012, oil paint, canvas, steel, brass, aluminum, metal filler, glass, 40 1/8 x 24 3/8 x 18 1/8". Sara Barker’s thoughtful, delicate constructions of wire, metal, and canvas were the quietest, slowest objects on view in London this Olympic summer. Standing on the floor at approximately human height, or wall-mounted and appearing more like architectural features, they resounded with a strong, independent voice. Barker is indifferent to refinement of fabrication, expensive or seductive materials, or any overt hankering after spectacular effect; in this sense, her work offers a real contrast to the high-spec, high-tech sculpture so common today. In Draft overlapped (all works 2012), for example, an aluminum structure is twisted and buckled, cut by hand with snips and pushed into place to make the join. Canvas strips don’t quite meet the edges of the metal support, coming unstuck.